It's summertime! 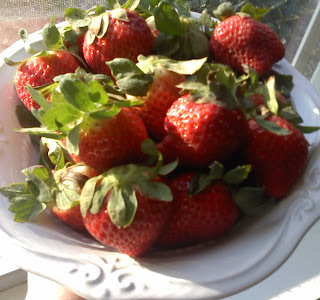 And that means an abundance of fresh, locally grown berries! If you have ever purchased berries only to find them covered in white fuzzy mold a few days later, here are some techniques guaranteed to work! To prepare fresh berries, that will be eaten within a week, start by sorting through whole berries and destem (blueberries). Fill a large bowl with three cups water and one cup white vinegar. Wash berries in this solution and then drain in a colander. Rinse under running water. While berries are draining in the colander line a salad spinner with paper towels, or a flour sack towel folded over a few times to fit within the bowl. Spin gently until completely dry. Store in a towel lined (paper or cotton) container with a loose fitting lid. Why vinegar? The solution destroys bacteria and mold spores, extending the life of the berries. If you plan to eat them within a couple days this process is not necessary. When freezing berries I do the same process then place in a plastic bag, remove the air and freeze flat on a baking sheet. Once thoroughly frozen they can be removed and stacked atop one another on a freezer shelf. If not thoroughly dried ice crystals will form on the berries, so for those of you not comfortable with that method here are two other proven ways to freeze fresh berries. First you need to prep the fruit you are freezing, wash and dry as instructed above. Strawberries need hulled and cut in half other berries picked over, stems removed. Once dried you can pack them one of two ways, a syrup pack or a sugar pack. It's been found that a syrup pack preserves the vibrant colors of raspberries and strawberries, but I have found plain freezing as I typically do retains color, maybe not as vibrant but I like not having the added sugar. Sugar Pack - toss two cups of fruit with 1 1/4 cups sugar (all berries; except blueberries they only need about 1/3 cup sugar). Spoon two cups into a quart sized bag, remove as much air as possible, and seal. Lay flat to freeze until solid (about 24 hours). Syrup Pack - Heat three cups of sugar and four cups of water in a saucepan over medium high heat, stirring frequently, until sugar has dissolved. Cool to room temp. Place two cups berries into a quart size bag and add two cups syrup (or enough to just cover the fruit). Seal and lay flat to freeze. Here are some great resources for nutritional information, recipes and farms local to Middle TN. Franklin Farmer's Market - Visit Kelley's Berry Farm, Delvin Farms and Blue Honey Farms for some of the best local berries around! Pantall Fruit Farm - Pick your own! Dr. Josh Axe Almond Blueberry Cereal - this stuff is AMAZING! And faster to make than pouring a bowl of boxed cereal! Use whatever berries you have on hand or in season! Dr. Josh Axe Berrie Smoothie - kids love this! I am having a drawing for a jar of my homemade organic strawberry jam, (made with local Kelly's Farm strawberries and organic sucanat). There are a few ways to enter. Follow this blog and leave a comment that you did so, and/or share the blog post on your Facebook page, Blog, twitter, etc. leaving a comment for each one. I'll use Random.org to pick and announce the winner on Monday June 6, 2011. Winner must be able to pick up the prize within a week of drawing. Love all your tips for berry season Honey! I will definitely be sharing your good news! Hope to see you soon! Hope I can learn something new through you! Love strawberries!! so does Amelia! I follow you of course & I want some of that jam! I know it has to be incredible! Great tips! Hope I can have that jam, heard it is great! Yum YuM, have reposted on facebook with my business and personal. Also it has been tweeted... Hope I win!!! Love me some of Deana's jam!! Proud of all you are doing, friend! SpringHillFRESH.com loves whoopie pies and your whole business concept! We wish you the best success and look forward to meeting you at the SH Farmers Market! !